Paneer is cottage cheese and paratha is stuffed bread. 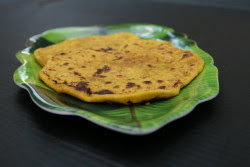 Spiced paneer is stuffed in the bread to make delicious paneer paratha. Paneer is rich in protein. Making paneer at home is very easy. Making homemade paneer: Just boil half gallon milk. When it reaches the boiling point, reduce the heat and add two tablespoons lemon juice. Stir and the whey will separate from paneer. Turn off the heat and drain the water using a cloth and hang it or keep pressed for an hour until all the water is drained out. Fresh homemade paneer is ready. 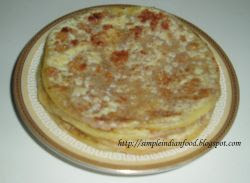 I have used this paneer to prepare a healthy paratha. Here is the recipe. Mix all the ingredients mentioned under the 'Filling', using a food processor or a mini chopper. Finely chopped green chillis can be substitued for red chilli powder. finely grated ginger and finely chopped coriander leaves can be add to the filling. Mix well and keep it aside. Take the whole wheat flour in a large mixing bowl. Add the salt and oil. Mix using the finger tips. Pour half a cup or three fourth cup water or as required and knead to a chapathi dough consistency. Make fairly small balls out of the dough. Roll the ball to three to four inches diameter and place a spoon full of the filling in the center. Draw up the edges together to seal the filling. Now dredge in the flour and again roll carefully to 5 inches diameter. Heat a tawa. Keep in medium heat. Place the rolled paratha in the tawa and drizzle oil on the sides and corners. 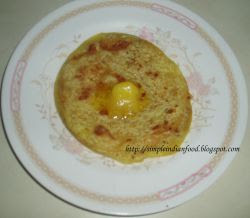 Gently press the paratha and flip the paratha after a minute. Apply ghee on the sides if desired. Serve it immediately with sour cream or plain yogurt/curd. 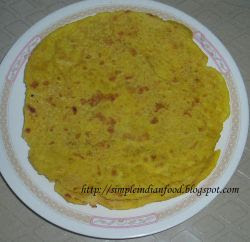 This is a very filling paratha as paneer is rich in protein. Just one or maximum two will do for dinner. This is my entry to Paneer - a delicacy event hosted by Vandana rajesh of Cooking up something nice. Thanks Vandana and waiting for the paneer roundup. A summer afternoon lunch is not complete without this delicious instant mango pickle in most of the households in south India. It is called maanga oorgai in tamil and maavinkai uppinkai in kannada. It takes hardly ten minutes to prepare this pickle. It is summer here and the groceries are filled with firm mangoes to ripe ones. I got a couple of mangoes to make my all time favorite pickle. Here is the recipe. Wash the mango and pat it dry. Dice the mangoes carefully into fine cubes (one centimeter size). Do not peel the skin. Transfer it to a mixing bowl. Top it with asafoetida powder and keep it aside. When it pops, pour the seasoning carefully on the mango. 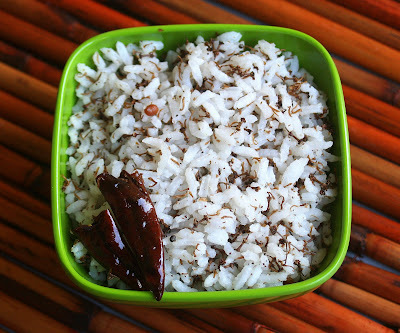 Mix well and the instant mango pickle is ready to go especially wtih curd rice. Wrap it in-between a roti or make a bread sandwich with this pickle. Enjoy anyway you want it. It is such a delightful pickle indeed. The same recipe can be tried with apples too. 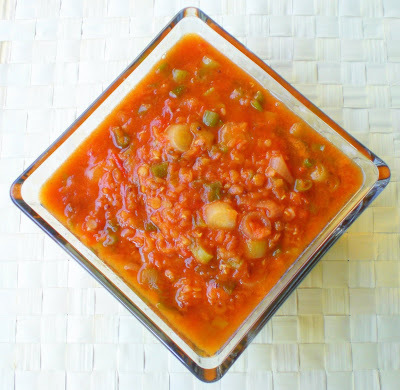 For variation, ground roasted fenugreek seeds can be added to this pickle. 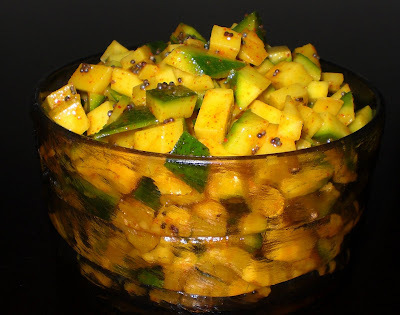 Just show a quarter teaspoon of fenugreek seeds in heat and dry grind the seeds and add it to the pickle before doing the seasoning. This pickle is my entry to Eating with the seasons - August. Poori with potato masala is one of the most common combo in south India. Both poori and masal are very easy to prepare. Just half an hour and a bowl full of pooris and a kadai full of masal will be ready. Here is how it is done. Cook the potatoes: Half the potatoes, wash them and pressure cook for 3 whistles. Wash the cooked potatoes in cold water and peel of the skin. Keep it aside. Chop the onions length wise. Heat oil in a kadai and add the mustard seeds and urud dal. When the mustard seeds pops, add the green chillies, ginger and chopped onions and fry onions until it turns transperant. Add the potatoes and pour a cup water. Mash the potatoes here and there and allow it to boil. Add the turmeric powder, asafoetida powder, salt and mix well. 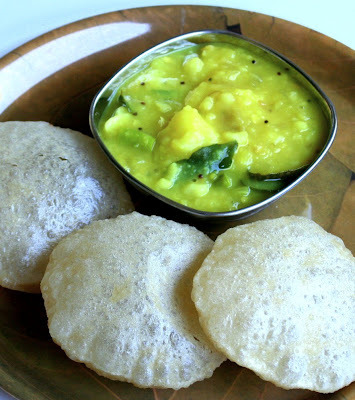 Turn off the heat and serve it with pooris or chapathis. This is a very basic recipe for potato masal. Take the flour in a large mixing bowl. Add the salt and one tablespoon oil. Mix using the tip of the fingers. Pour half to three fourth cup water or as needed. Make small balls out of the dough. Take one ball and roll into 3 to 4 inches diameter by dredging in rice flour diameter and slide it into the hot oil carefully. Rice flour is used so that the oil can be resued. Using a ladle (with holes - kannu somutu) press it a little. The poori will puff into a ball. Carefully turn to the other side and in few seconds (or until the sizzling stops), take out the poori by draining oil in the side of the kadai. Transfer it to kitchen paper towel lined in a bowl and let the excess oil absorb in the paper towel. Make poories one at a time. Repeat until the dough is over. 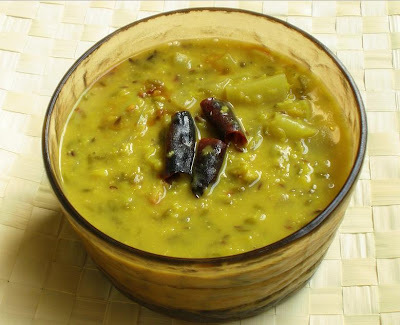 Enjoy these delicious poories with Potato masal or Channa masala. The potato masal for pooris/chapathis is my entry to Curry Mela hosted by Srivalli of Cooking for all seasons. I am a coffee lover and I wanted to share the taste of my everyday coffee. I am really addicted to coffee, just once a day, everyday. For me, the day starts with a cup of freshly brewed coffee and I am sure this is the same for every coffee lover in the world. I like Madras Kaapi that I will never miss everytime I visit Saravana Bhavan and Madras Cafe in Sunnyvale, CA. They have the best Madras Kaapi in the SF bay area. 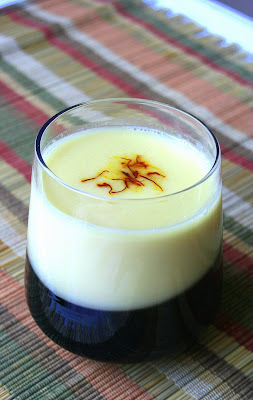 Kaapi is slang for coffee in Tamil nadu. After I tasted the Seattle's Best - french roast coffee, I don't prefer any other brand or any other variety in the same brand in the US. The best decoction that makes the day. Thanks to my friend Priya for introducing this coffee to me. All you need is French roasted, ground Seattle's best coffee powder and a coffee maker. I use Black & Decker 5 cup coffee maker with stainless steel carafe. Of couse you will need #4 coffee filter. I don't regret that I don't have a typical south Indian style coffee filter brewing Narasus's coffee or Leo coffee from Tamil nadu, after making decoction in this coffee maker. Just one tablespoon of coffee powder for one cup of coffee and it is ready in two minutes. Pour water in the water resorvoir. Place the #4 filter in the filte basket. Add exactly 2 tablespoons coffee powder and press it so that the powder is equally distributed in the filter. Place the carafe and switch on the coffee maker and let it start brewing. Meanwhile, heat milk in microwave for 2 minutes. When the milk is ready, the decoction will also be ready as it takes only a couple of minutes to brew. Turn off the coffee maker and pour the hot milk in the carafe and add 2 spoons of sugar. Adjust the sugar to your taste. Stir briskly and pour immediately in the coffee cups. 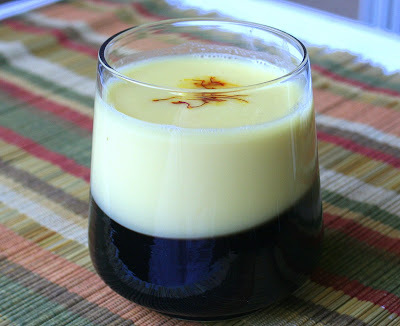 You can as well heat the milk in 2 cups and then pour the decoction to the milk and stir with sugar. Enjoy the intense, bittersweet coffee with the aroma of the fresh brew. Hmmm... that is one best coffee. "Kaapinna...Seattle's best french roast coffee dhaan... besh besh....romba nallarukku...."
Click here to see my entry to Click - Coffee and Tea hosted by Jai and bee of Jugalbandhi. I have taken a picture of Starbucks coffee chocolates. They might look like coffee beans but they are chocolates infused with dark roast coffee.